Islamic State Dumped At Least 6,000 Bodies In Mass Graves In Iraq, U.N. Says "Victims include women, children, elderly and persons with disabilities, members and former members of the Iraqi armed forces and police," says a new U.N. report that details 202 mass graves. 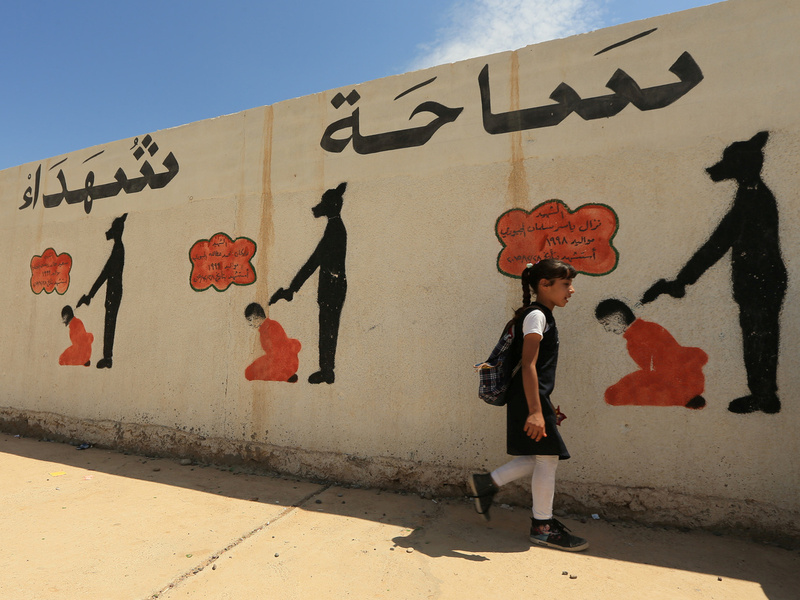 In Mosul, reminders of the Islamic State's brutal rule include a school wall covered with drawings showing how militants executed their prisoners. The U.N. says the area around the city holds mass graves where thousands of people were buried. Investigators have found 202 mass graves in Iraq, a grisly reminder of the Islamic State's terror-based control of large parts of that country, according to a new report by the United Nations. The agency says at least 6,000 people were buried at the sites — and possibly more than 12,000. "Victims include women, children, elderly and persons with disabilities, members and former members of the Iraqi armed forces and police, and some foreign workers," according to the report, titled "Unearthing Atrocities," from the U.N. Human Rights Office and the U.N. Assistance Mission for Iraq. Scattered across Iraq's north and west, the graves are a reminder of the Islamic State's shocking cruelty, violence and disregard for human life in the dark period from 2014 to 2017. The graves also pose a huge logistical and investigative challenge for Iraqi authorities wanting to provide answers to families who lost loved ones. So far, Iraq has excavated 28 mass graves, the U.N. report says, adding that the remains of 1,258 bodies were recovered from those sites. "Families of the countless victims who perished at the hands of ISIL have a right to know what happened to their loved ones," said Suki Nagra, the human rights director of the U.N.'s mission in Iraq. "The mass graves documented in our report are testament to profound suffering and shocking cruelty. They need to be protected and treated as crime scenes, with evidence preserved for criminal prosecutions." Some of the mass graves contain fewer than 10 bodies. But others hold far more — particularly in Mosul and in Nineveh province, where the Islamic State held on to power until 2017. At a sinkhole south of Mosul, investigators estimate as many as 4,000 people were buried, the report says. The U.N. believes that some 30,000 civilians were killed during the Islamic State's reign over wide swaths of Iraq — a figure that it warns is "an absolute minimum." The mass graves hold evidence of acts "that may amount to war crimes, crimes against humanity, and possible genocide," the report states. The U.N. also laid out its recommendations for preserving that proof, and easing the identification and recovery process for families. The killings were part of an Islamic State plan, as its gunmen used the most brutal of methods to carve parts of Iraq away from Baghdad's central control. Police and military service members were targeted, along with Yazidis and other religious minorities, who died by the thousands, the U.N. says. In one infamous example, the report notes, "On 12 June 2014, on the grounds of the former Presidential Palace of Saddam Hussein in Tikrit, ISIL killed approximately 1,700 members of the Iraqi Security Forces and army cadets. These killings became known as the 'Camp Speicher massacres.' "
The extremist group set up ersatz police forces and courts, condemning people on a wholesale level. Executions were often carried out in public to heighten the impact on Iraqi citizens. And death came by a variety of means: The report lists "shooting, beheading, bulldozing, burning alive and throwing persons off the top of buildings." Despite the staggering loss of life, the U.N. notes that the mass graves don't show the entire picture of what Iraqis have lost. "Incidences of killings where remains were discovered in houses and elsewhere, and the bodies subsequently not buried are not included" in the mass graves report, the U.N. said. As investigators find the remains of people who suffered at the hands of the Islamic State, other mass graves are still being discovered that date from Saddam Hussein's rule. The Iraqi dictator ordered tens of thousands of people to be killed and buried as he cracked down on any attempts to challenge him.